I found his blog by accident on WordPress’s homepage, and love his photography. In this post, I love how he can capture these people so well through their eyes alone. I do believe that “the eyes are the windows into the soul” and you can truly see their souls through these photographs. I almost didn’t post this because it’s so close to the end of the month, but figured I should share what I’ve written so far. I’m ridiculously far behind in writing reviews, mostly because I’ve been feeling so burned out lately and not at all like writing. So the following reviews are from June and July. I’ve honestly not been doing too much on the Caldecott or Newbery award list challenges. I am currently reading an advanced reader’s copy of a new adult book called The Door in the Mountain by Caitlin Sweet, which is a take on the Minotaur myth from Greek mythology, except from the point of view of the people involved instead of an outsider’s look. I’m currently listening to Wil Haygood’s The Butler: A Witness to History, which I’ve been wanting to check out for awhile. It’s cool because it’s not just a look at Eugene Allen’s remarkable life (which The Butler movie is based off of) but also the Civil Rights Movement and each president that Allen served at the White House and their role in the movement from the 1950’s-1980s. It also features a little about African-Americans and race, in general, in film. I’m excited to listen to Code Name: Verity by Elizabeth Wein next and the 11th book in the Bloody Jack series by L.A. Meyer, Boston Jack after that. I picked up this title because it is my son’s nickname, plus I love the author/illustrator. BooBoo is a little blue gosling who likes to eat everything. One day she eats a bubble and starts burping them up. A small turtle advises her to drink some water and she does and the burping stops. Recommended for ages 2-5, 2 stars. My son enjoyed this book. The story was pretty basic. With rhyming text, a penguin runs a steam train which he takes to the coast. He picks up all kinds of animals on the way around the track. I enjoyed the bright and colorful illustrations. Recommended for ages 2-5, 3 stars. Like a lot of other bedtime train books I have read with my son, this book takes you on a journey to Dreamland, stopping first in Giggletown, Snuggly Cove and even a town called Yawwwwwn. The train starts off fast but gets slower as its passengers reach Dreamland. Recommended for ages 2-6, 2 stars. I like Cousins’ books for their simple stories and brightly-colored illustrations. This book introduces toddlers/preschoolers to the idea of going to school. Maisy is going to preschool, where she paints, plays with her friends, uses the potty, snacktime and naptime. Her school is a lot like my son’s daycare, as far as the kind of things they do during the day. Recommended for ages 3-5, 4 stars. Oh my goodness! My son got completely obsessed with this book. It’s one of the first books he started quoting (and still does all the time). I picked it up originally because I love cephalopods. 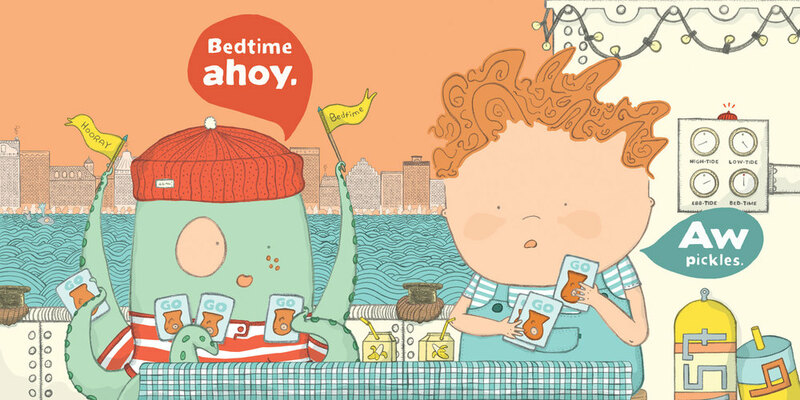 It is a book about a boy and his octopus that live on a steam boat and they are getting ready for bed. But every time Octopus tries to help, things get really silly. Like he tries to give him a bath and the boy thanks him, then the readers realize that it’s “a bath in egg salad”, to which the boy exclaims “No thank you, Octopus!” The octopus finally gets his comeuppance at the end of the book. This is a very fun book to read-aloud together with your child. We are definitely getting a copy of this book for our personal collection because of how much my son loves it. Recommended for ages 3-6, 5 stars. I found a train book by this author and got it for my son. We both liked the story and illustrations, so when I found this book at another branch, I immediately grabbed it. I liked this one way better than the last one as it seemed to have more of a storyline. A motorcycle cop pulls on the road to the beach only to find it completely stopped. He goes up the road and each car makes a different noise and response. He passes first a station wagon with a little girl who asks her parents “Are we there yet?” and later an ice cream truck and a dune buggy full of surfers. Eventually he discovers that the road is blocked by some sheep who have escaped from a fence near the road. Everyone gets out to help move the sheep and the cars finally start moving. Recommended for ages 3-6, 3 stars. I picked up this book because I loved the illustrations for Perfectly Percy, plus the story sounded cute. Petunia loves skunks. She loves that their cute little noses, their stripes, and everything else about them. She desperately wants one for a pet, but her parents say no. So she decides to run away. On her way, she meets an actual skunk and boy is it stinky! So stinky in fact, that she runs all the way home. Then she realizes it was “awesomely stinky” but she’d rather have her stuffed skunk as a pet. That is until she meets a porcupine. My son loved the whole “skunks are too stinky” and it really made him laugh. Recommended for ages 3-6, 3 stars. My son absolutely loved this book. Even now, after we have returned it a week ago, he is still quoting parts from the book. I was not as impressed. It just came across as too dumbed-down and repetitive. The illustrations were cute though. The title pretty much sums the book up. Dragons love tacos and so will do anything to get them. They also love parties, so put these two things together and you have a winner. Only don’t use spicy salsa of any kind because it makes dragons smoke from the ears, breathe fire (literately), and have tummy troubles. 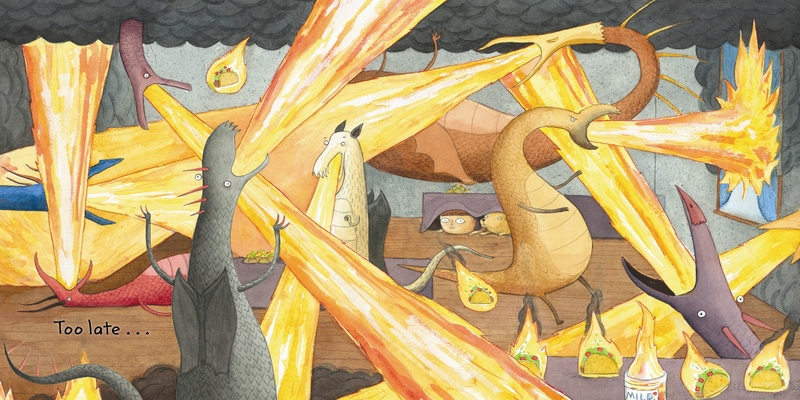 Bad things happen when you mix tacos and spicy salsa, like dragons will burn your house down. But they will help you rebuild, with taco breaks of course. Recommended for ages 3-7, 3-1/2 stars. I picked this up for my son for two reasons. First, he loves dinosaurs and second because he is fascinated by diggers (excavators), so this seemed like the perfect book for him. It was a really simple but well-done book, perfect for little boys, though I’m sure little girls would get a kick out of it as well as it a fun book. It is a counting book from 1-10 and show how 10 different dinosaurs working together with construction can create something really cool. The front end pages feature the kind of dinosaurs in the book, and the back end pages show the construction equipment used in the book. I’m sure this will be a book I will buy for my son and use for storytime as well. Recommended for ages 3-7, 5 stars. I was on a hunt for dinosaur books because my son loves them and this one was brand new, so I decided to give it a try. This one really cracked me and my son up! It’s all about all the things you can use a dinosaur for, like opening cans, yardwork and pretty much anything else you can think of, including a bookmark. Recommended for ages 3-7, 5 stars. I picked up this book at the library for myself because of the subject matter and the illustrations, which I adored. It is a very simplified version of the epic Hindu poem, the Mahabharata. Ganesha is a young elephant-headed god (always one of my favorites in Indian art), who along with his friend Mr. Mouse, loves Indian sweet called laddoos. Ganesha especially wants to eat the super jawbreaker laddoo, with which he promptly breaks one of his tusks on. He is so embarrassed by his broken tusk, but Mr. Mouse says it doesn’t matter. Shortly after this, they happen upon the poet Vyasa, who asks Ganesha to write the Mahabharata with his broken tusk and it takes a really long time. Mr. Mouse occupies himself with lots of sweets in the meantime. Finally they are done. The illustrations give a brief visual description of what happens in the poem, but I think it would be better to hear an audiobook version of the tale (the author mentions that it is not a 100% accurate view of the actual poem). The illustrations were fabulous and really drew my eye to the book, despite the semi-complicated storyline (especially when you’re trying to explain it all to a 3-year-old). You can tell the illustrator is also an Pixar animator. The book totally made me crave Indian sweets while reading it. Recommended for ages 5+, 3 stars. This book is an exciting story which takes place in the fictional land of Prydain, which based off the country of Wales in the Middle Ages, and is full of borrowed heroes and gods from Welsh mythology. The reader is introduced to Taran, an orphaned young man who yearns for sword-fighting and adventure. Alas, he is simply an Assistant Pig-Keeper of the oracular (can see the future) pig Hen Wen at Cair Dalben, the home and farm of the ancient Enchanter Dalben. One day, all the animals on the farm all run away from a mysterious force and Taran must go find Hen Wen. He stumbles upon the evil Horned King and his Cauldron-Born (powerful fighting zombies) by accident, and is nearly killed before being rescued by Prince Gwydion. 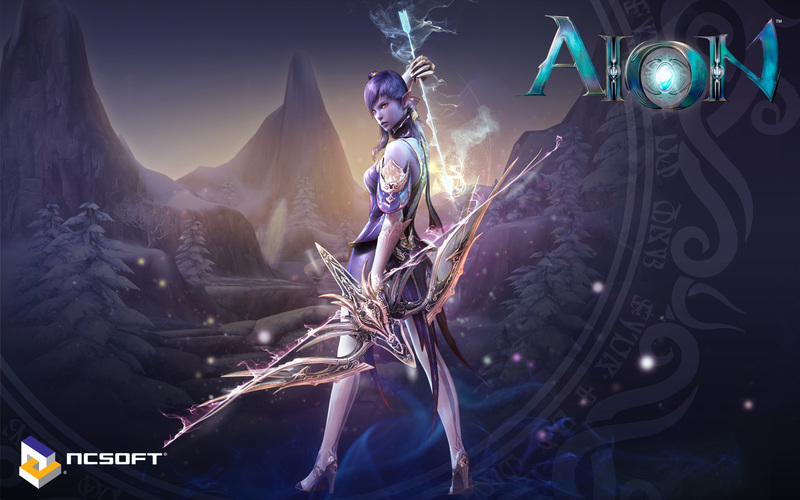 They are captured by Acren, a powerful enchantress who used to rule Prydain and sent to rot in her dungeons. It is in the dungeons that Taran meets Princess Eilonwy, who subsequently rescues him and his “friend”. Taran quickly realizes that the “friend” is not Gwydion but a traveling bard named Fflewddur Fflam. Gurgi, a shaggy creature joins the party. Instead of taking up the search for Hen Wen, the group decides to go to Caer Dathyl, the home of King Math to warn him about the approaching army of the Horned King and his Cauldron-Born. Will they be able to get to the castle in time to warn the king or will the castle be overrun with Arwn’s forces? To find out, read the exciting first book of The Chronicles of Prydain! Recommended for ages 10-14, 4 stars. I started reading The Chronicles of Prydain as a whole after learning that two books in the series won a Newbery or a Newbery Honor award. It’s kind of amazing that this book was written in 1964 as it feels really modern and timeless. It did totally remind me of a tribute to Lord of the Rings in the beginning of the book, especially after they introduced Gwydion and Gurgi, which almost exactly mirrors Aragorn and Gollum. The narrator, James Langton, is quite good and narrates the entire series. I love Eilonwy’s independence and Flewddur Fflam and his truth-telling harp! 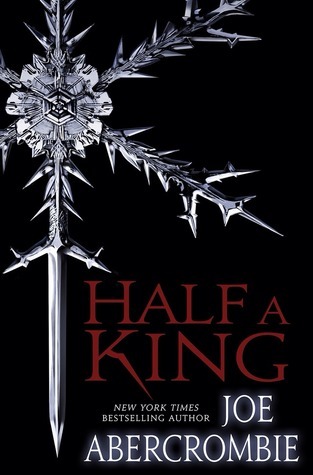 Overall it was a great start to the series, and actually better than the Newberry Honor winning second book. The book tells the story of Claudette Colvin, who in March 1955, was the first African-American to refuse to give up her seat to a white person on a bus . The seats at the front belonged to the white passengers, while the African-Americans rode in the back, but they had to give up their seats if there was no room. Claudette was sitting about halfway back and was asked to give up her seat for a white lady and not only refused but also did not come willingly when the police arrived. People in the African-American community in Montgomery didn’t know what to make of the spunky teenaged girl who wasn’t afraid to stand up for what she believed in, and there plenty of people that didn’t like that a young girl was the first person to protest the Montgomery buses. It wasn’t until Claudette’s mentor, Rosa Parks, did a similar thing nine months later that African-Americans on the whole supported what she did and started the bus boycott, which really launched the Civil Rights Movement in America. Recommended for ages 10+, 5 stars. After I had read a good review by a Goodreads friend, I decided to give this 2010 Newbery Honor award winner a chance. The book is based off interviews from Claudette Colvin herself and others that lived in Montgomery, AL in the 1950s, so the reader has a very first-hand view of what was like during the days of the Jim Crow laws. I had never heard of Ms. Colvin before this book, and truth be told, only knew the basics about the start of the Civil Rights Movement, even though I lived in Alabama for a good chunk of my life. It’s not something that was really talked about, and is a hard subject to broach in a still racially divided city. I felt sorry for Claudette Colvin because she was pushed aside by adults who wanted freedom and equality but didn’t think a young girl should be the start of it. I did not like this one as much as the first one because the story was so slow-moving, plus it was a little predictable. This book won a 1966 Newbery Honor. The story of Taran in the land of Prydain continues in this book. In this volume, Taran and his companions Fflewdur Fflam, Eilonwy, and Gurgi are ordered by Prince Gwydion to find and destroy the Black Cauldron, the instrument used by Arawn to construct his zombie Cauldron-Born warriors. Taran must learn to work with a proud young prince named Ellidyr, as they search the Marshes of Morva for the three enchantresses rumored to be in possession of the Cauldron. Will they be able to find it and destroy the Cauldron before Arawn and his deathless warriors find them? Recommended for ages 10+, 3 stars. A very thorough introduction and glimpse into all kinds of root vegetables, including some I had never heard of like crosne, malanga, and celery root. I liked that she included when it’s seasonally available (especially important if you’ve never heard of it but are interested in trying it). I liked that she gave the different names for the roots in many different countries, which is helpful for me in regards to Asian varieties and because even the British word for certain root vegetable is not the same as in the US. As I’ve rediscovered beets, I was very glad there was a large section on that particular vegetable. I would love to own this cookbook. 5 stars. This was a very fresh approach to food with some really beautiful photography. The recipes themselves were pretty simplistic as you don’t really have to cook anything. Whenever I think of raw food, I always think vegan, but the book included meat and fish as well. There were only about four recipes that I would like to make. 3 stars. I picked up this cookbook because I had been on the website and agree that it is a great resource for vegans and vegetarians, as not all countries are veg-friendly. While some of the recipes looked appealing, they like a lot of restaurant cookbooks, seemed to be food I’d rather have professionals prepare at the restaurant itself versus me doing it at home. I would like to try the Thai Noodles and the Porcini-Crusted Tofu with Garlic Mashed Potatoes and Candle Mushroom Gravy. I would also like to check out these restaurants: 222 Veggie Vegan in London and Lovin’ Spoonfuls in Tucson, AZ. 2 stars. This book tells the story behind the man who would become Captain Hook, the villain in the Peter Pan stories by J. M. Barrie. It is hard to think of him as a man, but we are allowed to glimpse Hook as a young man in Restoration-era England as he goes from an educated trader’s son to that of a rakish young man hell-bent on revenge because of all the misfortunes that have befallen him. He forsakes the love of two women, one of which ultimately spells out his punishment in the dream world of Neverland. Hook and his original crew drift to Neverland in a fog (literally and figuratively) and are doomed to fought and be killed over and over again by Pan and his boys. Only Hook doesn’t actually die, but is constantly being reborn to fight Pan another day. It’s not until he has been there a few centuries that he meets an Englishwoman named Stella Parrish that will forever change his life. Just who is this woman and is she the key to Hook finally getting out of Neverland? To find out read this fascinating take on the Peter Pan myth. 4 stars. This book originally drew me in with its comparisons to works by Gregory Maguire, who I have enjoyed in the past. 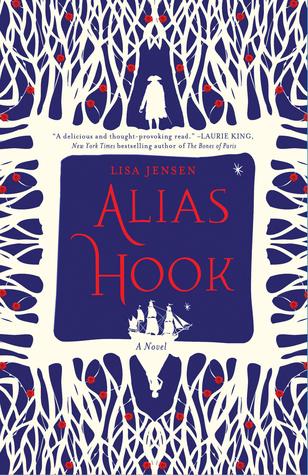 The story does stall a bit in the middle, as Hook is trying to figure out more about himself and Stella’s new role in his life. I liked that the author made the story into an action adventure fantasy romance, but also with a healthy dose of reality as well. Let me explain. We are given a bird’s eye view of James Hookbridge’s development from a young man fascinated in carpentry, though this is looked down upon by his middle-class father, to his role as the leader of a gang of young rich men who gallivant around London’s pleasure houses, which is of course again looked down upon by his father. He then goes off to prove himself, only to be taken advantage of by a man who thought was his friend, who took all that James owned or was given. I honestly would never have thought of Captain Hook as a man with a past, but the author really makes him human and 3-D, not only as the man destined to be Peter Pan’s mortal enemy. The revelation about the men who become his crew members was particularly fascinating, and totally made sense. I also found it intriguing that they made Pan into the whiny vicious child, always getting his own way, instead of the hero of the tale as he is usually portrayed. It was almost like a total role reversal for Pan and Hook. Disclaimer: I received this advanced reader’s copy book via Netgalley in exchange for my honest review.